Limbo relies on our C++-11 implementation of Gaussian processes (See Gaussian Process for a short introduction ) which can be useful by itself. This tutorial explains how to create and use a Gaussian Process (GP). We assume that our samples are in a vector called samples and that our observations are in a vector called observations. Please note that the type of both observations and samples is Eigen::VectorXd (in this example, they are 1-D vectors). to call the method compute(). Here we assume that the noise is the same for all samples and that it is equal to 0.01.
std::tie(mu, sigma) = gp.query(v), which returns the mean and the variance at the same time. The second approach is faster because some computations are the same for mu and sigma. Most kernel functions have some parameters. 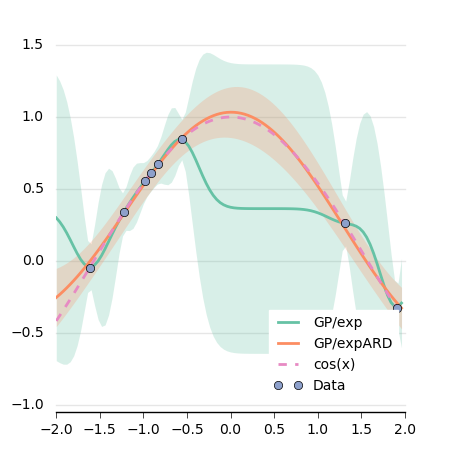 It is common in the GP literature to set them by maximizing the log-likelihood of the data knowing the model (see Gaussian Process for a description of this concept). In limbo, only a subset of the kernel functions can have their hyper-parameters optimized. The most common one is SquaredExpARD (Squared Exponential with Automatic Relevance Determination). After calling the compute() method, the hyper-parameters can be optimized by calling the optimize_hyperparams() function. The GP does not need to be recomputed and we pass false for the last parameter in compute() as we do not need to compute the kernel matrix again (it will be recomputed in the hyper-parameters optimization). // do not forget to call the optimization! This will create a directory called myGP with several files (the GP data, kernel hyperparameters etc.). If we want a binary format (i.e., more compact), we can replace the TextArchive by BinaryArchive. Note that we need to have the same kernel and mean function (i.e., the same GP type) as the one used for saving.